You only know so much about a person as how much they choose to tell you. This really makes me think. Somebody could be living a whole other life in this world and I wouldn't know about it because they don't choose to tell me. There are a lot of things that many people choose not to tell others and for good reasons. It makes me really wonder what is it that people are hiding. You could think you know somebody inside and out, yet still not know them. Me, for example. I choose to tell people certain aspects of my life but you could never tell what is going on in my personal life because I have learned to cover it up very well. I could be in office laughing all day, but then go home and cry in the car and nobody would ever know. Life is all about choices. What you choose to tell and what you choose not to. Sometimes either can get you into trouble. But we have to decided whether or not it is worth the price. Some people are worth the truth, no matter the consequence, and others are not. Your past molds you into who you are today. Your choices have gotten you to today. 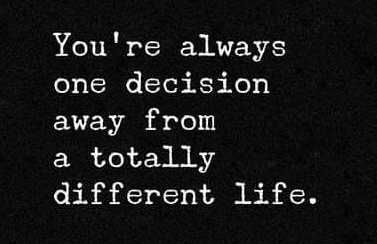 Everyday that you wake up, make the right choice. Trust the right people. Choose your life how you want to spend it.